Orosi High School in partnership with the Tulare County Child Abuse Prevention Council (CAPC) will host “The Lisa Project in 10” exhibit, an interactive experience about child abuse, prevention, and awareness. Exhibit entrance is free and open to the public. Children must be 12 years of age or older to participate. “The Lisa Project in 10” is a 10-minute, unique multi-sensory experience allowing the visitor to hear, see, and experience the reality of the world of child abuse. While the exhibit is not designed to be disturbing, it is eye opening and provides understanding that could save a child’s life. The CAPC is working to increase the exhibit’s exposure throughout Tulare County to heighten the public’s awareness and understanding about what some children in the county experience. “Our goal is to educate and engage the community to be the voice for children. With one in eleven children in Tulare County being reported victims of abuse, we cannot ignore the importance of speaking up. 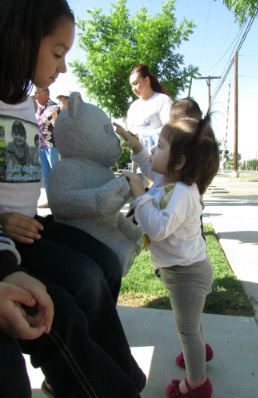 Through this project we hope to change the culture of secrecy surrounding child abuse and neglect,” stated Ramona Chiapa, Executive Director of the Tulare County Child Abuse Prevention Council. Earlier this year CAPC was able to purchase “The Lisa Project in 10” for its outreach efforts. The purchase was made possible thanks to generous community support from various entities such as – CAPC, Visalia Unified School District, Tulare County Office of Education, Visalia Business Bank, Visalia Breakfast Rotary, Soroptimist International of Visalia, and Kaweah Delta Health Care District. This enables the exhibit to go on the road to various communities, schools and organizations for education and outreach. To learn more about The Lisa Project or how you can bring the exhibit to your community, please contact the Tulare County Child Abuse Prevention Council by phone (559) 735-0456 or email info@@tulare1206.editllc.com. The Child Abuse Prevention Council (CAPC) of Tulare County was established as a private nonprofit council in 1982 in Visalia. The purpose of the CAPC has always been the promotion of child abuse prevention in the County through advocacy and education.